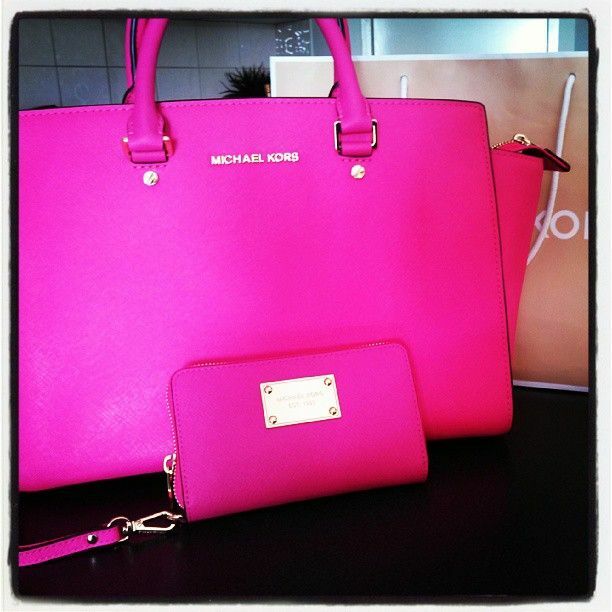 I love purses, almost as much as I love shoes. One day while at our grandson's basketball game, I noticed the woman sitting in front of me on the bleachers. Actually, I didn't notice her, I noticed her large, hot pink, designer purse. It was beautiful, very beautiful and I knew it was expensive. I noticed, too, how she kept it close to her and always seemed to know exactly where it was. She would not have been likely to walk away and leave it sitting on the bleachers. When we pay a great deal for something we take care of it more. It isn't easily replaced and is therefore more dear to us. As Christians, we have been purchased with the greatest price ever. We have been purchased with the precious blood of the Lord Jesus, freely given for us on Calvary. Our salvation is a free gift to us, but it cost the very life of Christ. Surely, as ones purchased with such a great price, the Lord knows all about us at every given moment. He takes care of us, He watches for us and is determined to "work all things together for good" in our lives. We can have perfect assurance that He is at work in and through us to accomplish His eternal purpose in Christ Jesus. There is not a thought in our heads or a situation in our lives of which He is not intimately acquainted. We can have faith in His ability to care and provide for us and to manifest His perfect peace, love and joy in every moment of our lives. and in your spirit, which are God's." For the last couple of months we have had the pleasure of watching our grandson play basketball and his sister cheer at those games. The players were young and often made mistakes, as is to be expected. At first the referees would stop often to have what they called "a teachable moment," giving instructions and explanations to the players and sometimes to the parents sitting on the bleachers. As the season progressed there was less need for "teachable moments" and more need for encouragement. And encouragement was given. It was given in the form of the audience shouting from the bleachers. It was given in the form coaches shouting from the sidelines. It was given in the form of teammates, both on and off the court, shouting. It was given in the form of cute little cheerleaders chanting simple cheers. There was encouragement coming from everywhere! If we could see with our spiritual eyes, we would know the same is true of us as Christians. The Father, the Son and the Holy Spirit encourage us. Our fellow Christians encourage us. And the Scriptures encourage us. In fact they tell us we are compassed about "with so great a cloud of witnesses." "Wherefore seeing we also are compassed about with so great a cloud of witnesses, let us lay aside every weight, and the sin which doth so easily beset us , and let us run with patience the race that is set before us," Hebrews 12:1. I don't know what that means but I do know it means there is never a time when shouts of encouragement are not coming or way. "Know ye not that they which run in a race run all, but one receiveth the prize? So run, that ye may obtain," 1 Corinthians 9:24. Yesterday was election day for twelve states in our nation. 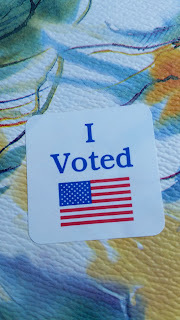 There is something very special about taking a ballot in your hand and marking it for the candidate of your choice. Filling in that little circle for a person we have chosen is such a tiny act in our lives but such a monumental act in our culture. Having a say in who represents us is a very special gift given by those who sacrificed so much to obtain and maintain this freedom. Sometimes we forget there are still places where citizens have no right to vote freely and no say in the workings of their government. After I voted yesterday, I began to think of the various types of voters. Some are not "voters" at all. Perhaps they are only vaguely aware of the fact it is election day. I know a few of the women I work with were surprised to know it was a day to vote. Some choose not to exercise this freedom, this gift, this responsibility we have as citizens for other reasons. They are too busy, they have given up hope or they are just too lazy to get up and do it. Some do not vote because they can't decide which candidate they should choose. Some vote, but barely know the candidates and vote by who looks the best, or who is the first on the ballot, or by some other superficial influence. Some vote by conviction. They know the candidate they want and head to the polls specifically to endorse him or her officially. Some vote by passion. They know exactly how their candidate stands on each of the issues. They share their passion with others around them and encourage others to vote for him or her as well. Some not only vote, but also campaign. They are actively involved in taking the choice of candidates to others. They spend their time, their energy, their money in trying to win other's to their candidate. To me, this is so much like becoming a Christian. There are those who never make the decision to come to know Jesus Christ as their personal Lord and Savior. Some are just too busy to consider it, and as Felix said to the Apostle Paul, they wait for a more "convenient season." Some cannot decide if Christ is "the way, the truth and the life" as He said He was. Some simply choose to live in their hopelessness and darkness rather than to come to know the Lord of Life. Then there are those who accept the Lord, but never seem to grow much in "the grace and in the knowledge of our Lord and Savior Jesus Christ." Some come to know the Lord and then go on to learn of Him through the Scriptures and through fellowship with other Christians. They are "ready always to give an answer to every man that asketh." By their words, their deeds they try to lead others to the Lord Jesus. And lastly, for some, the love and grace of the Lord consumes their very life. They dedicate all their time, their energy to spreading the gospel of the Lord to everyone they see. They campaign for their Lord and seek that all should come to know Him. If you could ask anyone of the candidates on yesterday's ballot which of these voters they would prefer --while a politician would surely say he or she would want ANY voter -- they would have to acknowledge they want the one who becomes an ambassador for their cause. Then I think of that question in terms of Christians. Which type are we meant to be? We know the Scriptures encourage us to "press toward the mark for the prize of the high calling of God in Christ Jesus." We are told that we are in a battle in which we "wrestle not against flesh and blood, but against principalities, against powers, against the rulers of the darkness of this world, against spiritual wickedness in high places." We are encouraged to "run with patience the race that is set before us." Yes, we are in a race ourselves. A race that entails every learning of our wondrous Lord, ever sharing Him with others and ever pressing toward Him and Him alone. of the high calling of God in Christ Jesus."